Have you noticed lately upon waking that you are suffering from a sore throat or dry eyes? Or perhaps your skin is noticeably drier with itchy, rashes covering random areas of your body? This could be the result of dry air quality in your current residence. Dry air can affect the body in numerous ways, from the skin on your body to your internal organs. It can cause in certain individuals dry eyes, throat, and skin, as well as nasal congestion and nosebleeds. If you are suffering from respiratory issues such as asthma or the common cold, dry air can increase the symptoms and make recovery a long stretch of road. So, what exactly is a humidifier? 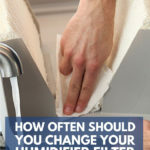 And what would be the best time or times to change the filter in your humidifier to add comfort to your household? Let’s find out! What is a Humidifier and Humidity? When to Change a Humidifier Filter for Each Type? A humidifier is a household or industrial machine that can change the levels of humidity in a single room or entire dwelling, depending on the size and strength of the one chosen. A humidifier is closely related to its exact opposite – the dehumidifier – as it registers and regulates air quality. A humidifier will add proper amounts of moisture to the air, whereas the dehumidifier can take it away. Thanks to the wonders of modern technology, a humidifier is now equipped to read the levels of moisture in the air and add only what is needed. Most devices come with controls that can determine when the machine switches on and off, what kind of moisture inducing mist is introduced to the atmosphere, and what temperature said mist will be it. It is recommended by most home-care experts that a home should have approximately a 50% level of humidity within the air during summer months and approximately a 30% level during the cooler winter months. But what exactly is humidity? We’ve all heard the expression “it’s not the temperature but the humidity making everything so sticky and muggy”. Humidity is the term used to describe the level of water vapor in the air. It is common for weather forecasters to describe the humidity levels of an area in either Absolute Humidity or Relative Humidity. The term absolute humidity is usually used to define the level of water vapor divided by the dry air in a certain amount of air at a particular temperature. Whereas, the term relative humidity is the ratio of the current absolute humidity to the highest possible level of absolute – which is 100% as the air cannot physically contain any more water. Then, usually, the area experiencing this percentage will experience rainy and damp weather. As with most major appliances, there are a wide variety of both brands and styles, types and special features. This section will focus not necessarily on particular brands or features but the basic five types of humidifiers available for household or commercial purchase through most pharmacies, hardware stores, and local health-care stores. This is the largest style of humidifier available on today’s market, as it is built directly into your home or commercial building’s air control system. They can be installed as part of a central air conditioning system or through your basic ductwork for home heating. As the largest type, they can also be the most expensive but lack the amount of maintenance a portable humidifier can carry. This type of humidifier is considered to be one of the cleaner humidifiers, as it blows water vapor into the air through the use of both a moistened filter and propeller fan systems. One of this types downfalls, however, is that it is confined to only one room of the house at a time and it can be difficult to control the level of moisture added to the air. It is essential to follow directions exactly when adding water to the filter for humidity control. This is the single most common type of humidifier purchased for home use and it can be found at your local hardware store or even pharmacy. It uses electricity supplied by a typical electrical outlet to heat water and expelled either cool mist or hot steam in the atmosphere of your home. Generally confined to one room, the most common complaint about this type of humidifier is the risk of burns to children, elderly and pets due to the steam it emits. Some higher-end brands offer the user the option to send either hot or cool mist into the air, decreasing this risk. This type of humidifier is increasing in popularity, even though it is one of the youngest types on this list. Water vapor is released into the surrounding air by the use of ultrasonic vibrations and can come in either cool mist or hot steam versions. This type of humidifier, like the evaporator, can only be used in a single room of a dwelling at any given time. This limitation can make it difficult to control the level of humidity being released into the air. They work in tandem with a set of rotating disks that run a warp or high speed to dispense moisture into the air, created from condensation and friction. Running at significantly lower price tag than that of its counterparts, it is also attractive to families as it carries no risk of burns to children and pets as it uses condensation rather than steam. Now that you are aware of the three main types of humidifiers available today, you should be able to narrow down which type has the greatest benefit for you and your family’s needs. Let’s take a look at how often they need to be maintained and how often should you change the filters in each machine. Some styles have reusable filters that may require a simple wash and dry, whereas others may require expensive filters purchased through the manufacturer each time your machine is due for maintenance. Now that we have discovered the five types of humidifiers, you’re probably wondering when to replace the filter on each one? Do they come with reusable filters or do they need replacement filters through your retailer or manufacturer when the time has come to change the filter? A humidifier filter is responsible for sending only clean water or moistened air into your home and to eliminate the threat of harmful mold or bacteria polluting the air. Central Humidifiers: It is recommended that a central humidifier installed in your dwelling home air system has it filter changed on a monthly basis, as mold or bacteria can easily be dispersed through the entire house. Some versions offer reusable filters that are cleaned using hot water and a mild soap whereas others need replacement filters through the manufacturer. Check which brand offers each type and use that to compare what would be the best option for your home. Evaporators:This type of humidifier has a recommended filter replacement every three months unless you use the humidifier every day – then it is shortened to every two months. Check with the manufacturer instructions to determine if you can clean your filter for a set period of time before ordering a replacement. Cool Mist or Hot Steam Humidifiers: Depending on the style of humidifier purchased, your filter will either have to be changed once every three months (Cool Mist) or not at all (Hot Steam). The hot steam versions of humidifiers do not come with a filter but instead requiring cleaning of the water panel once every two months to ensure air quality. Ultrasonic Humidifiers: The ultrasonic humidifier comes equipped with a filter that should be cleaned every three months or every two if in use each day. Once the filter is noticeably worn or damaged – replace the filter entirely and restart the cleaning cycle. Impeller Humidifiers: This style of humidifier does come with a filter that should be cleaned in a vinegar/water solution after each use. As it uses friction to create condensation, dirt and debris can easily become stuck to the filter and be dispensed into the air. Now that you have discovered what a humidifier is, how to replace humidifier filter, what the proper levels of humidity currently are, and how having one located in your home – especially during the cold winter months – can benefit yourself and your family health wise; maybe you’ll look at purchasing one for your home. Talk to your local healthcare provider or pharmacist to determine what humidifier would benefit you the most; especially if you currently suffer from existing health conditions. As with any major purchase, make sure to research each type of humidifier and their counterparts, the level of maintenance required for each machine, and any additional warranties offered either through your retailer or the manufacturer itself. Ensure that you use your humidifier as per instructions, as too much water in the air can lead to additional health and even structural issues by encouraging the growth of mold in the walls or wood of your home. If you have experience using a humidifier or perhaps you know the best brands on the market today for dwellings of all sizes, let us know in the comments below! We would love to hear your perspective on how beneficial a humidifier can be when used correctly!